We noticed a few red spots on Henry’s back Sunday night. By Monday he had developed a case of hives all over his body. We still aren’t sure what caused them, but they’ve subsided and he’s feeling much better since this photo was taken last night. This entry was tagged hives, kiss, sick. Bookmark the permalink. Could it be something he ate? Hope Henry is feeling better! Oh poor little Henry Boy…. 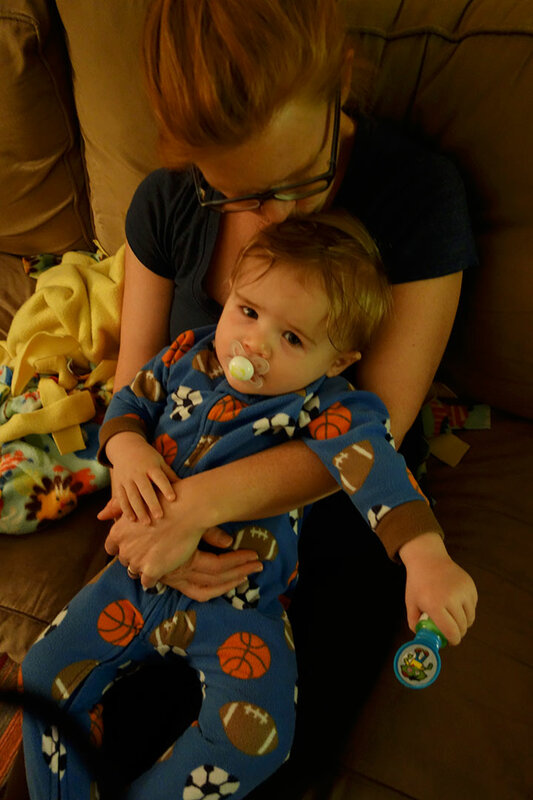 he is so sweet….one bright side, they sure do like to cuddle when they dont feel good…. but sorry to see him looking so down. Kiss him for me. We don’t think it was something he ate because he didn’t eat anything too different than normal. This sad look makes it look like he was really suffering, but he was totally fine and being his normal, vocal self minus the hives. He was, of course, a bit drowsy from Benadryl. All the hives have faded for the most part and just a runny, snotty nose remains. For whatever reason, and in my childhood days things were not necessarily investigated, Il lived with hives. Spent half my young life in a tub of cool water and baking soda. I was just labled “she’s just nervous”, but I think it is usually caused from food or detergent or a million other things. Kiss that baby for me, and I hope you get to the bottom of it. A runny nose, definitely signals that he has allergies. Even some kid at school who has some dog breed that Henry is allergic to. Oh, I’m so sorry our sweet Henry had hives and I’m so glad to read that he’s not really suffering. I had a terrible, almost life-threatening case of hives when I was 16, after getting a tetanus injection and a penicillin shot at an ER for a foot injury. After that I was told never to get either injection again, and since I didn’t, I’m still around ! Please kiss Henry for me, I do miss y’all so much. And Henry is beautiful even when not feeling well.